It is that time of the year again where I live. All things scary, orange and black are coming out. Personally Halloween is one of my most favorite holidays! If you looked at my digital scrapbooking stash, you would agree! I have never met a Halloween digital scrapbooking goody that didn’t holler (spookily I might add. lol) for me to buy it. That isn’t what we are here for today though. I will showcase the great Halloween goodies in the store in two more weeks. 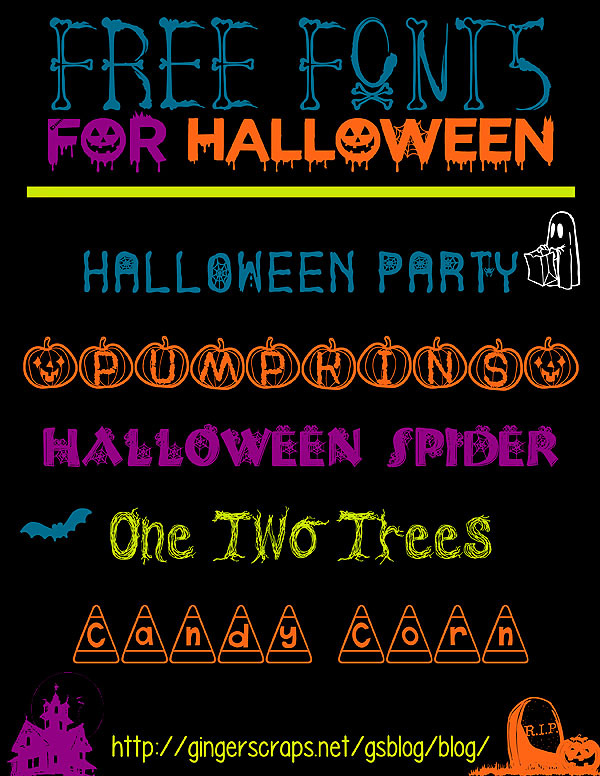 For today…”Something Wicked This Way Comes!”….As the title suggests, we are going to be looking at Halloween Fonts!! All these are free and guaranteed fun! 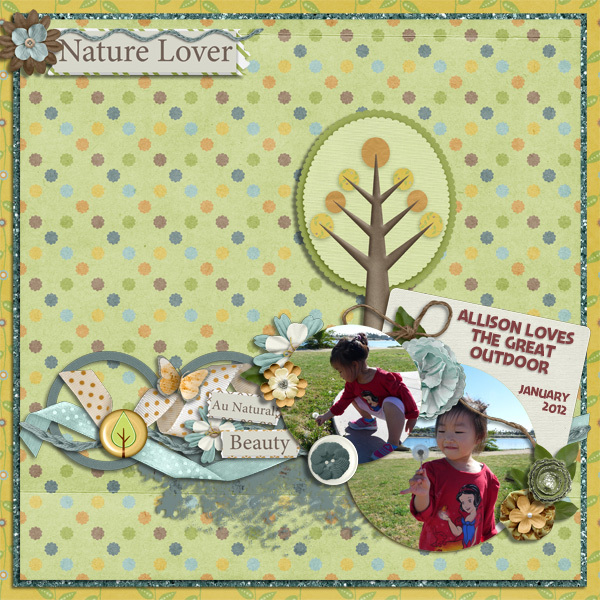 They are a great addition to any digital scrapbooking layout. Be it for a title, added elements, or wordart. (links to the fonts below image). I have a 9 year old son who is basically obsessed with all of these. Well, Harry P was for me if I am being honest. 🙂 I had all of these in my font stash already. We would love to see your layouts made with these fonts. Make sure to upload them to the gallery and come back and link us up in the comments. Check back next Saturday. We will be showcasing some fun Pop Culture digital scrapbooking supplies to go along with these fonts. I also have more of these fun pop culture fonts in my stash. I will be back in the future with some more. Here is where you can find each one. Enjoy! 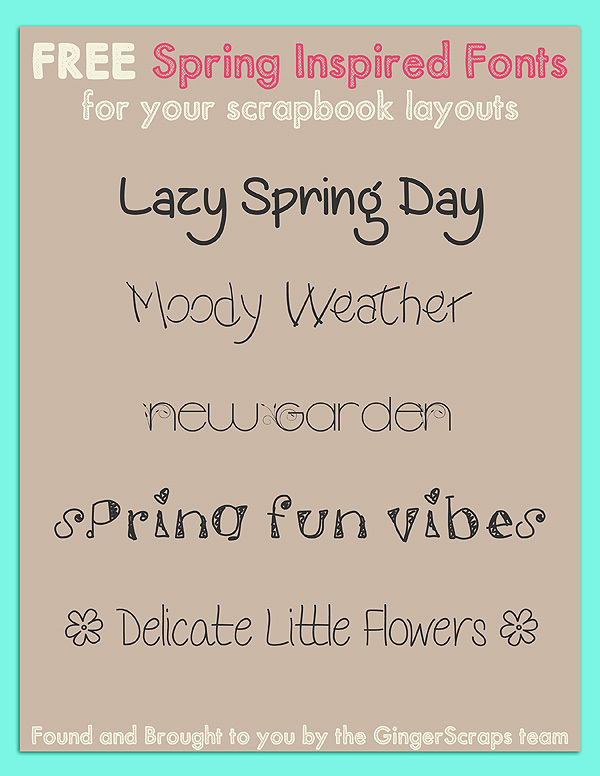 Here are you some fun and free spring inspired fonts for your digital scrapbooking layouts. Below are the links to these fonts. Have fun! Good morning scrappers! Did you have a lovely Valentine’s Day? Now that we have that us behind us, don’t forget to scrap those photos. 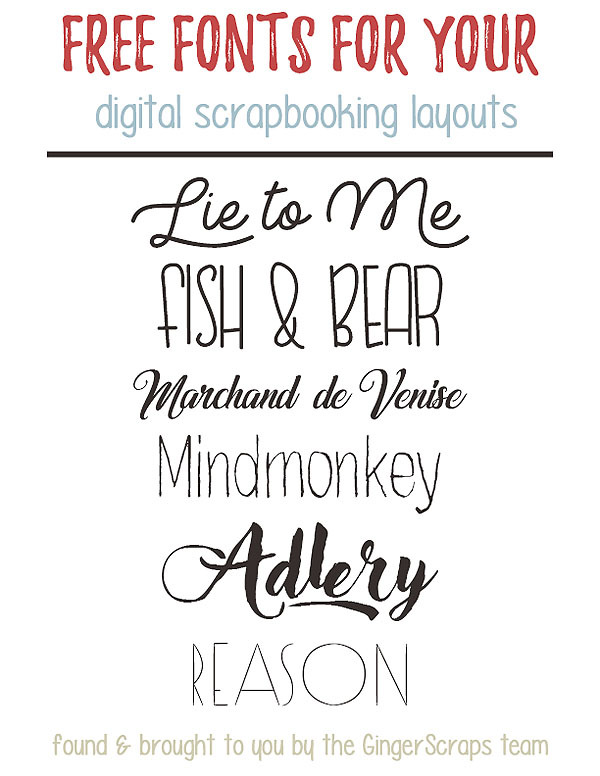 To go along with great digital scrapbooking items to get those photos scrapped, you need a great font! That is where we come in. 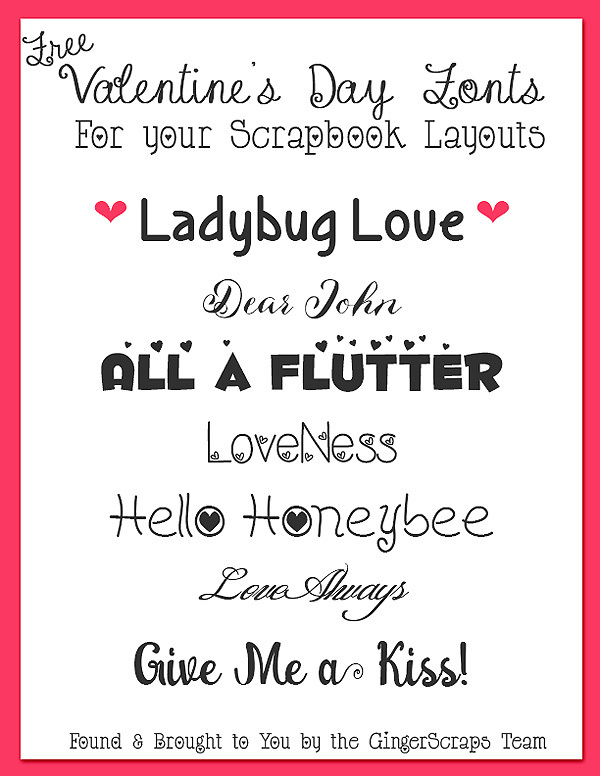 We looked all around and gathered you some free Valentine’s Day inspired fonts. The links are below. I hope you like these fonts as much as I do! We would love to see what you scrap with them. Make sure you if you use them to link us back up! I think for the most part all our kids are back in school, right? Gotta get those fun school photos scrapped. We’ve already talked about those back to school digital scrapbooking supplies. Now, let us talk fonts! This post will be short and sweet. 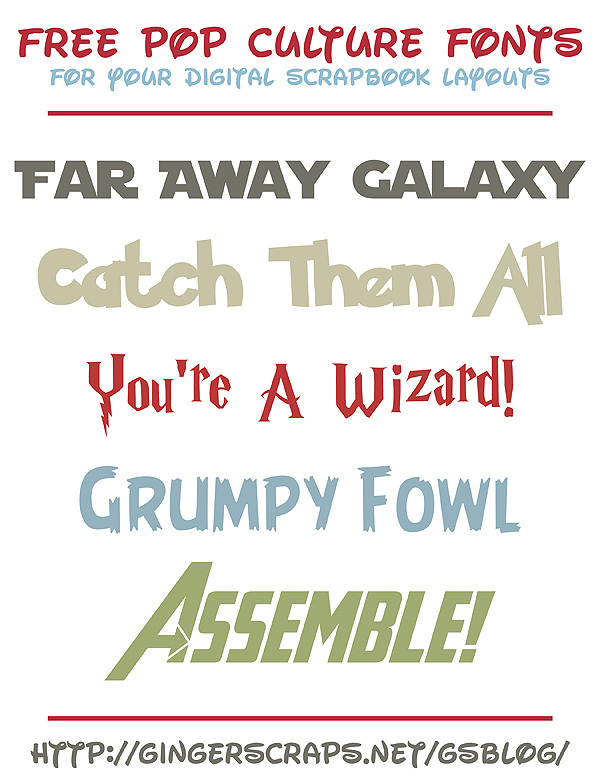 Here are some great fonts to add to those layouts. A great addition to any back to school layout. (links below the image). There you go! 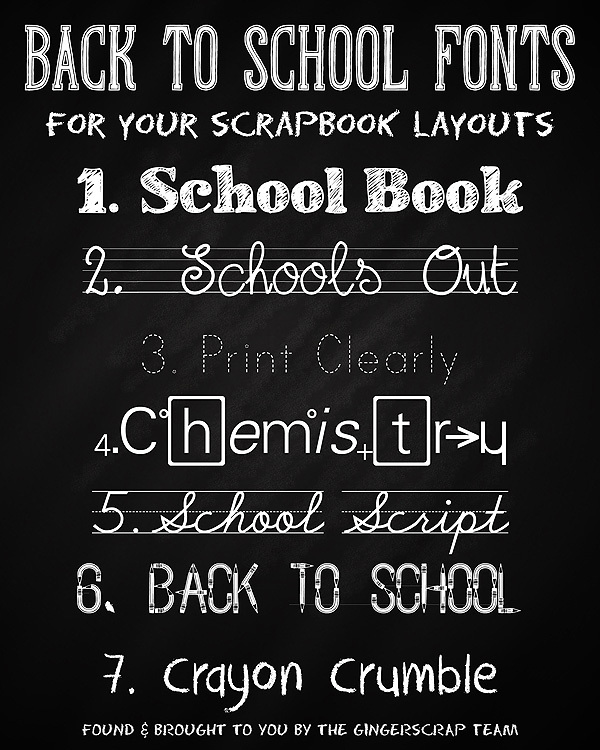 Fonts for you back to school layouts. We would love to see what you scrap. Make sure you are uploading to the gallery & then link us back up! Happy Scrapping! I love cursive fonts and this one flows so beautifully. The font challenge is always a favorite of mine because it lends itself to all kinds of creativity without restraining too much. In other words–it’s easy! 😉 Here’s some inspiration for you! Okie doke gals, I’m off! Y’all have a fantastic week! It’s definitely a classic font, perfect for any layouts, but especially all the Christmas ones you’re sure to start creating soon! 🙂 The layouts for this challenge are already flooding into the gallery; there are plenty to choose from, but here are a few of my favorites for your own scrapping inspiration! Happy Tuesday, ladies! Hope everyone had a restful long weekend and you’re all bright-eyed, bushy-tailed and ready to scrap! With just a couple of days left in May (OMG it’s almost June! ), I’ve got one more monthly challenge to spotlight for you all. This week, I am shining a light on the May font challenge, hosted by JoyLynn of Blue Heart Scraps! I am always in the market for new fonts to spruce up my layouts and this month, I just happened to be looking for some big, bold fonts for titling. Luckily, JoyLynn already found a great one for us to use in this month’s challenge: take a look! Cute, right? I love the feel of this font and how versatile it looks. To prove the versatility, my fabulous fellow forum ladies have created some really gorg layouts using the font! It was super difficult for me to pick a few to highlight; this month the layouts for the font challenge were simply outstanding! Here a few to get your scrapping mind a’ tickin’! There might only be a few days left in May, but that’s plenty of time for you to hunker down and churn out some layouts and earn yourself a treat! If you have any questions on this or any of our other monthly challenges, head over to the Cookie Jar and ask away. We got loads of smart cookies just waiting to help you!